Messiaen’s monumental Turangalîla-symphonie is one of the composer’s greatest achievements and a masterpiece of the 20th-century repertory. Composed during the aftermath of World War Two, this powerful ten-movement work represents the culmination of Messiaen’s musical language up to his middle years, exploring the full resources of a large orchestra and taking the listener on an almost superhuman rollercoaster of expression from the relentless, stupendous and cosmic to the intimate and deeply personal. The result is an immensely bold and optimistic work that celebrates both human and divine existence. The title is derived from two Sanskrit words. Turanga signifies ‘time’ or the movement of time; as Messiaen remarked, ‘time that flows like sand in an hourglass or time that runs like a galloping horse.’ Time has an additional meaning for the composer in that it also refers to the work’s complex rhythmic procedures, a defining feature of Messiaen’s innovative musical language. Lîla signifies life, movement, creation and destruction on a cosmic scale; also – and most importantly – love. While on the surface, this long work is a stupendously complex piece, Messiaen described Turangalîla in simple terms: a ‘hymn to joy’ and ‘a song of love’. For Messiaen, the ‘joy’ is superhuman, overflowing, dazzling and abandoned, while the ‘love’ is that fatal and irresistible love, transcending all things and suppressing everything outside itself, symbolised by the love-potion of Tristan and Isolde. Turangalîla was the result of a commission for the Boston Symphony Orchestra by Serge Koussevitsky, who gave Messiaen the enviable instruction to ‘choose as many instruments as you desire, write a work as long as you wish, and in the style you want’. Leonard Bernstein conducted the première in Boston on 2 December 1949. Yvonne Loriod, who became the composer’s second wife in 1961, was the piano soloist, and the ondes Martenot was played by Ginette Martenot, daughter of the instrument’s inventor. The first British performance was a BBC broadcast in 1953 conducted by Walter Goehr. The ondes Martenot has a continuing existence largely thanks to Messiaen and his Jeune France associate André Jolivet. Unlike its predecessor the theremin, the ondes Martenot has a familiar interface – the piano keyboard – that makes it easy to play precise pitches. Unlike the piano, only one note may be played at a time (chords are not possible), although the pitches can be bent through using a metal ring attached to a ribbon placed in front of the keyboard. Playing ‘on the ribbon’ also creates the instrument’s distinctive sweeping glissando and vibrato effects. Turangalîla belongs to Messiaen’s self-declared ‘Tristan Trilogy’, a group of works including the song-cycle Harawi (1944) and Cinq rechants (1949) for unaccompanied voices, which explore the subject of love and death. Messiaen looked to Wagner’s treatment of the Tristan myth in which death symbolises the fulfilment of love. Indeed, the sublime slow sixth movement ‘Jardin du sommeil d’amour’ equates with Tristan and Isolde’s night of love in the second act of Wagner’s opera, while Messiaen’s symbolic garden also links with those evoked in Debussy’s Pelléas et Mélisande, Jeux and Ravel’s Daphnis et Chloé. Although Messiaen abandons Christian symbolism in his ‘Tristan’ works, the concept of the love-death is central to Christianity through the association of profound love with sacrifice; God’s love for mankind is symbolised through Christ’s sacrifice on the cross, death representing the beginning of new life through love. At the time of writing the ‘Tristan’ works, Messiaen was also deeply absorbed in the study of pre-Columbian mythologies, which he discovered had similar preoccupations with love-death symbolism. While Harawi and Cinq rechants draw specifically on Peruvian folklore, his relation of certain thematic ideas in Turangalîla to the ‘terrifying brutality of old Mexican monuments’ associated with sacrificial acts connects with his interests of this period and contributes to the sense of awe at mankind’s relationship with the cosmos. As Messiaen’s musical language is distant from Austro-German traditions, his choice of the second element of his title, ‘symphonie’, is both unique in his output and surprising, not least as its use has a complex history in 20th-century French music. Messiaen much admired the music of Debussy who disliked the title ‘symphony’; neither Debussy nor Messiaen had any affinity with traditional symphonic forms. While Debussy never composed a work simply titled Symphony, and was scathing about the form throughout his critical writings, La mer is subtitled Three Symphonic Sketches. Ravel too was cautious about using the term, although described Daphnis et Chloé as a symphonie-chorégraphique. All three composers sought to find a way of describing a large-scale orchestral work that was coherently constructed but which approached form and harmonic structure differently from conventional Austro-German symphonic traditions. Yet, movements one, four, six and ten of Turangalîla were originally conceived as a four-movement symphony following a plan of introduction, scherzo-trio, slow movement and finale. These were combined in the next stage of the compositional process with the three movements entitled Turangalîla. Originally called ‘tâlas’ due to their use of Indian rhythms, these sections are austere and brooding in character, suggesting association with ideas of death. He then wove in the remaining two ‘Song of Love’ movements, which evolve the ‘love’ theme first announced in ‘Chant d’amour I’. The exuberant fifth movement of ‘joy’, which Messiaen candidly explained was intended to depict the peaks of carnal passion, was the last to be added; its placing before the ethereal calm of the sleeping lovers in ‘Jardin du sommeil d’amour’ indicates a sensuous narrative, although Messiaen’s celebration of human love is intended as a reflection of divine love. The work thus embeds ideas of exposition and development into its overall structure but is not a symphony in any conventional sense, despite incorporating vestiges of traditional symphonic forms. Turangalîla is further unified through the use of cyclic themes, a principle that links with Messiaen’s symphonic predecessors such as César Franck and Albert Roussel. 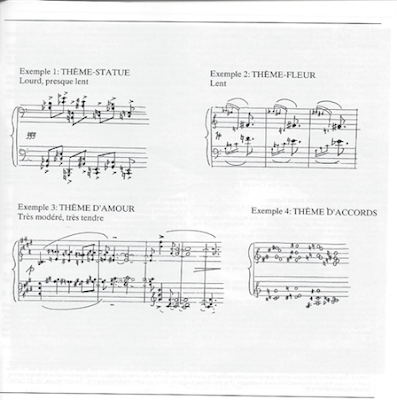 Three of the four main cyclic themes have a symbolic significance underlined by Messiaen’s own descriptions. The ‘statue theme’, comprising a succession of slow and strongly accented quavers first heard on fortississimo trombones and tuba, is intended to be assertive and masculine. The ‘flower theme’, announced on pianissimo clarinets, is so-called because of its delicacy and curvaceous melodic shape, which, according to Messiaen, resembles ‘the tender orchid, the ornamental fuchsia, the red gladiolus, the supple corn-lily’. These contrasting themes, both presented in the first movement, symbolise masculine and feminine elements – the phallic ‘statue’ and the yielding ‘flower’ –, which are transformed and intertwined in the third main cyclic theme, the ‘theme of love’. A more abstract, purely musical idea represents the fourth cyclic theme, a sequence of chords. Turangalîla reflects Messiaen’s instinctive eclecticism, incorporating Hindu and Greek rhythms, as well as birdsong. While tonality plays its part, notably in ‘Jardin du sommeil d’amour’, which is centred in F sharp major, Messiaen’s favoured key of ‘love’, his harmonies generally derive from his own modes of limited transposition. 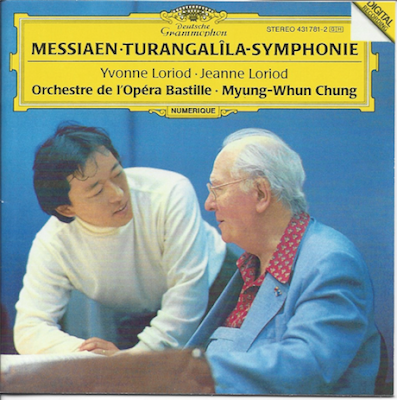 The Turangalîla-symphonie is such a large and complex work that its completion marked a watershed in Messiaen’s creative output, stimulating new directions in his increasingly birdsong-focused works of the 1950s and beyond. There are a few works by Messiaen that could be regarded as symphonies, such as L'Ascension, "Quatre Méditations symphoniques pour orchestre" or, if you accept the very unusual orchestration, perhaps even Couleurs de la cité céleste or Et exspecto resurrectionem mortuorum. But the only work that he called a "symphony" right there in the title is the Turangalîla-symphonie composed between 1946 and 48 on a commission from Serge Koussevitzky for the Boston Symphony Orchestra. It is well worth reading Messiaen's notes though they may not reveal as much as you may hope! For example, apart from mention of many of the techniques we have discussed, such as "non-retrogradable" rhythms, he also mentions something he calls "rhythmic characters" in which there are three elements: one is active, taking the leading role, another is passive, reacting to the first, and the third is apart and remains the same. This technique, which he uses in a number of other pieces as well, is never explained more clearly except to say that one character may augment, the other may diminish and the third stays the same. One can imagine how this might work, but further explication would require close study of the score, which, for now at least, I do not have. The Turangalîla Symphony is one of Messiaen's most popular works, partly due to the fact that it is one of the few orchestral pieces by him that can fit into a normal orchestral program. It has, over the sixty-seven years since its composition, become one of the classics of 20th century music, a piece that can be listened to and enjoyed for the sheer pleasure of it, and one that is, at the same time, an influence and inspiration to other composers. Esa-Pekka Salonen, as guest artist with the New York Philhamonic this season, has chosen presenting this work as his major project other than conducting his own music. I said that the orchestra is large: it includes triple winds and a large string body with 16 first and second violins and the other sections to match. The extensive percussion includes glockenspiel, celesta, vibraphone, triangle, temple blocks, Turkish cymbal, normal cymbals, Chinese cymbal, tam-tam, Basque drum, maracas, side drum, Provençal tabor, bass drum and tubular bells. And out front, of course, the solo piano and ondes Martenot. If you hear something that sounds like the sound-track to an old Star Trek episode, that's probably the ondes Martenot. The title of the work is the combination of two Sanskrit words. Turanga means, loosely, movement and rhythm, while Lîla signifies divine action on the cosmos, creation and destruction and love. There are very simple and lyrical sections, such as we find in the Garden of love's sleep, and enormously complex sections with many layers of interlocking rhythms; there are chorale-like chants and wild orgiastic dances. It is safe to say, I think, that this work can stand alongside The Rite of Spring by Stravinsky as one of the great works of the century, bold, challenging and ultimately rewarding.